We’d love your help. 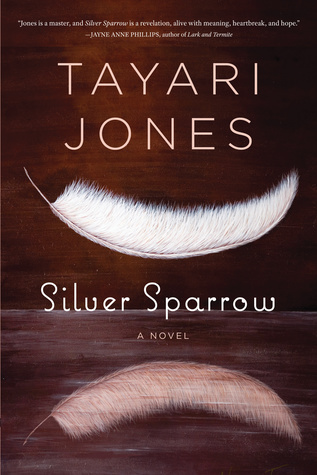 Let us know what’s wrong with this preview of Silver Sparrow by Tayari Jones. With the opening line of Silver Sparrow, "My father, James Witherspoon, is a bigamist," author Tayari Jones unveils a breathtaking story about a man's deception, a family's complicity, and two teenage girls caught in the middle. Set in a middle-class neighborhood in Atlanta in the 1980s, the novel revolves around James Witherspoon's two families--the public one and the secret one. When the daughters from each family meet and form a friendship, only one of them knows they are sisters. It is a relationship destined to explode when secrets are revealed and illusions shattered. As Jones explores the backstories of her rich yet flawed characters ”the father, the two mothers, the grandmother, and the uncle ”she also reveals the joy, as well as the destruction, they brought to one another's lives. At the heart of it all are the two lives at stake, and like the best writers ”think Toni Morrison with The Bluest Eye”Jones portrays the fragility of these young girls with raw authenticity as they seek love, demand attention, and try to imagine themselves as women, just not as their mothers. To ask other readers questions about Silver Sparrow, please sign up. what is a red bone? This is my first book I've read by Tayari Jones. I enjoyed it very much. The majority of story takes place during the 1980s in Atlanta. "Atlanta ain't nothing but a country town". "Silver Sparrows" is about two families. James Witherspoon is a bigamist. He was already married ten years when he first meets Gwendolyn ( Gwen). The first half of the book is told by Dana Lynn Yarboro . (Gwen's daughter). Dana tells us how her mother and James first met. ( gift wrapping counter). Dana's mother knew Jam This is my first book I've read by Tayari Jones. I enjoyed it very much. The majority of story takes place during the 1980s in Atlanta. "Atlanta ain't nothing but a country town". The first half of the book is told by Dana Lynn Yarboro . (Gwen's daughter). Dana tells us how her mother and James first met. ( gift wrapping counter). Dana's mother knew James was married. His other daughter, Chaurisse, was never a secret. James 'wife' is named Laverne. Gwen accepts that James found Laverne first...and respects his wife's rights. After all, she has legal documents. ( I was laughing - thinking.... boy, that's all it takes - legal documents, huh.. - to be ok for your husband to have another wife and daughter? "ok, lol"!!! ). As for herself, Gwen, words like concubine, whore, mistress, and consort are 'unfair' nasty words that come up in conversation- mostly if Gwen is tipsy, angry, or sad. So, Gwen and Dana know about James other family. However, Laverne and Chaurisse know nothing about them. The second half of the book is told by Chaurisse. We begin to understand why Gwen accepted her invisible secret hidden life. However -- soon both daughter's world collide. The truth is this story breaks our hearts ...but it's also 'enjoyable-to-read'. Both daughters voices as narrator are equally important to see the 'big picture' of what's going on. The dialogue is authentic- the story becomes more and more complex. It's heartrending, powerful, funny, and this entire book has a rich quality easily felt between the author and her historical knowledge of her generation --- growing up in Atlanta. I liked it! This review has been hidden because it contains spoilers. To view it, click here. There was a good premise here - 2 daughters, 2 mothers, 1 father. Only 1 mother/daughter pairing knew of the other. And then ultimately, they would all come together somewhow. It was the coming together that didn't wow! me - I wanted more from that very important turn-their-life-upside-down moment. There were a lot of questions I had when I got to the last page. Why didn't Raleigh have his own lady-friend, why did he hang his whole life on his not-brother and his family? Why did Dana befriend Cha There was a good premise here - 2 daughters, 2 mothers, 1 father. Only 1 mother/daughter pairing knew of the other. And then ultimately, they would all come together somewhow. It was the coming together that didn't wow! me - I wanted more from that very important turn-their-life-upside-down moment. There were a lot of questions I had when I got to the last page. Why didn't Raleigh have his own lady-friend, why did he hang his whole life on his not-brother and his family? Why did Dana befriend Chaurrise, did she genuinely want to be her friend or was her plan to eventually expose their father? Was Dana just trying to replace Ronalda? Dana's mother knew James was married, beyondhaving the affair and a baby, why did she want to be a second, illegal wife? What did she hope to gain? WHat did James think would come of it? What did James and Dana's mother say to each other after it all happened? How did Dana and Chaurrise avoid each other after it all happened for so long; granted, Atlanta's not a small town, but it seemed they were in a small enclave with many overlapping acquaintances? James left Dana and her mother, it seemed, pretty easily - did he love them, was it really that easy and simple a decision for him? Silver Sparrow was chosen as one of the top 10 books of 2011 by Library Journal. Here is an NPR article about this wonderful gem. Here is a Washington Post about Silver Sparrow. What does the “other woman” represent in the nightmares of women everywhere? The mere thought of an “other woman” existing is terrifying, horrifying, humiliating and for many, beyond imagination. What if the “other woman” had a child? What if she lived in the same town and neighborhood? What if the “other woman” was Silver Sparrow was chosen as one of the top 10 books of 2011 by Library Journal. What does the “other woman” represent in the nightmares of women everywhere? The mere thought of an “other woman” existing is terrifying, horrifying, humiliating and for many, beyond imagination. What if the “other woman” had a child? What if she lived in the same town and neighborhood? What if the “other woman” was not a passing fancy, but existed in the husband’s life for decades – visiting her for dinner, giving her money to support herself. What if the husband’s friends and family knew about her? Is the “other woman” to blame? Is the child? How does the child of an “other woman” grow up emotionally healthy when she knows she is living in a shadow? When she knows that she is a secret? What kind of man, husband, father would live this sort of double life? And which family would he choose if his secret was exposed. Silver Sparrow explores the very complicated walls and paths drawn around the hidden life that a bigamist lives and that of his secret second wife and their child. The main portion of the story takes place during the 1980s in Atlanta, and is told from two points of view. The book begins with Dana, the bigamist’s secret daughter. The unfolding of the story with Dana's point of view, immediately put Dana as the sympathetic character. And as Dana told the story, I almost was able to believe that the father may have been doing somewhat right by her. Ms. Jones is such a skillful writer, in that she allowed me to buy completely into their life. The second half of the book focuses on Chaurisse, who is also a daughter of the bigamist’s, but by his first marriage – and thus his public relationship. From the beginning of Chaurisse's point of view, it becomes clear that what Chaurisse has is a true father and a much truer family experience. ; poor Dana has the cast-offs. The contrast between each girl’s life becomes starker as the story unfolds. We learn that, incredibly, both Dana and her mother are invested in protecting the bigamist’s secret; they are invested in protecting their life in the shadows. I say incredibly, because at some point shouldn’t they become frustrated with being pushed to the side? At some point will they have a need to bring it to light? And how does the “first wife” not guess about the duplicity? Does she not wonder why her husband is gone every single Wednesday? Does she not notice that money is missing? Both wives have their own careers and truly are able to support themselves and their daughters. They are not in a situation where they are dependent on their man – the bigamist – to support them financially. So where does the emotional dependence come from? Why stay? The story does not explore these points directly asked, but they are explored implicitly. Dana and Chaurisse are the same age, however both girls do not possess the same level of knowledge about each other or about their father. Dana and her mother know all about Chaurisse and her mother; they live in their shadow. Every choice and step that Dana and her mother take is tempered by whether Chaurisse and her mother will be there or choose to do something similar. Dana is truly a “second”. Chaurisse and her mother have no idea that Dana exists. But Chaurisse “gets” her father on a daily basis, she lives with him and has the intimacy of a father-daughter relationship. Dana does not have any of this. Her father, while a weekly visitor, is a mystery and almost an intangible. Through the telling of the story by Dana and Chaurisse, readers are also taken back in history and treated to a story telling of the adults’ lives as children. The characters in Silver Sparrow are richly developed, not only Dana and Chaurisse, but also the ancillary characters that assist in creating (and maintaining!) this situation – the mothers, the father, and the father’s best friend. Through the interplay of the various characters, readers are pulled into this beautifully told story. And let me tell you, it is an entertaining immersion, you will not regret it, but it is painful as well. There are some truly heartbreaking scenes where the characters hurt each other – hurt in a deep emotional way. Hurt in a way that as a reader, I did not know how they could survive such pain. This is a wonderful story, a beautiful book and I highly recommend it! This is a book that so many "bookie" friends have recommended to me. I just recently found it in my local used bookstore with a round of other much recommended books and so I decided to dive right in. Since so many have already read it, I'm not too sure what I could say that hasn't already been said but of course, give my opinion. Let's start with the composition. This is an extremely tempting and curious book. From the first page as our narrator starts to Complicated. Complicated. Complicated! Let's start with the composition. This is an extremely tempting and curious book. From the first page as our narrator starts to tell her story the reader is immediately sucked in. It's intriguing to find out what is happening? What is this story really all about. The story is written from the point of view of the two daughters in this book. The first half is told by Dana and the second half by Chaurisse. I found the author did a great job at creating distinction between the two voices. Even within either of those two narrations we hear voices from other characters within the book as the story is being told and the author again is quite skilled in delivering the various personalities. The author does a great job of connecting the reader with the characters with the alternation of the narrators. You really get the point of view from each side. I do recommend this book. I do want so very dearly to give it a perfect score but for reasons I can only discuss in the "spoiler" portion below.. it's a GR 4 star but my personal score system has halves so technically this is a 4 1/2.. so.. there we are. I recommend to the Chick lit readers because it's got drama, to the African American fiction readers, Lit readers and people who like a good relationship drama. This is a story of lies, deceit, secrets and need. More than that, there's no other way I can think of to go into this but to talk about the book.. so I'll toss the old spoiler alert on right now for those who need it. Below is what the book is about and my opinion. When I started this book. I didn't know what I was getting into. I started to listen to Dana's story. The beginning of Gwen and James love story. It seemed normal enough until we learned that James was already married. It still seemed a little romantic until it hit you the weight of what they were doing. A second marriage? A second simultaneously marriage? When Dana began to tell her story, she mentioned these other women in her community. Possibly of some cult, wearing white and in church, several of them and the one husband. I at first thought maybe this was what this book was about. But no. It was very reminiscent of stories those of us growing up in African American communities in America may have heard of. There is always some "gossip" in the community or some family lore. And this was very reminiscent of "it". I could almost hear the sisters gossiping about it in the hair salon. "Ummm, girl did you hear about that Witherspoon?". "You mean the one owns that limo service." "Um, girl that's the one." Lowers voice, looks both ways in preparation for the good gossip. Whispers, "Girl, he ain't no good!" "I heard he got two wives!" "Yes, Chile. And get this.... two little girls months apart." "Now, I can't believe that because you know.. the look of him.. he don't look like doodely squat with them big ole' Coke bottle glasses and he's short!" Laughter erupts. One lady slaps her leg. The other throws her head back. "You know you ain't right!" "It's the truth! And you know that brother of his..."
"Fake brother. Cause you can look at them and see Raleigh ain't no blood brother of his." "True. True. But Raleigh ain't too bad lookin either. I must say that." "Yes, you MUST say that." Scene ends. Curtain comes down on the Beauty shop set. I really connected with this book and the characters. Maybe I've come across people who were similar. Maybe I know some of those qualities. Maybe I recognize them. Maybe some of the situations, relationships, quotes are reminiscent of things that I've experienced, witnessed, heard about. There was a real connection. I felt so bad for Dana & Chaurisse/Laverne because James and Gwen.. and even Raleigh had put those two innocent girls into this dysfunctional situation. Gwen chose to play house with a man she knew was already married. No matter what she thought it was.. that was "play house". She seems to have gone into this "arrangement" out of a need for a husband and she knew it was not right and she even had the opportunity to redeem herself when Raleigh proposed but she allowed a child to make the decision for her. Which I'll never comprehend. Gwen was very childlike to me. Sneaking around like a stalker watching Chaurisse and Laverne. And it ticked me off that she taught this to Dana. Poor Dana's very existence was pitted against Chaurisse and created this competition. This need to be validated. James was just as much at fault as Gwen. I understand he married Laverne when they were very young. But he took "obligation" too far. When he fell for Gwen, he could have just had an affair, as some do. Not saying it's right but he became a bigamist. Those are lies unforgivable. To live to lives and lies to that degree is just selfishness personified. Maybe it was out of obligation. Maybe he felt pushed by Gwen. Maybe it validated him because he sounded kind of ugly. Made him feel good as a man to have two women. He thought he was special. During Dana's section of the book, you thought that James did care for them. By the time you got to Chaurisse's section and the end of the book.. it seemed as if this had turned into some obligation and he didn't even care much about Dana and Gwen. All the talk of love seemed like words. That all his time with Gwen and Dana over the years had been obligation or routine or to pacify them, actually. "If I do this.. give them a little time, a little money.. they won't tell my secret that I made a long time ago and now can't get out of.. so I have to keep it going." Raleigh... poor Raleigh. I feel so sorry for him. I've seen so many "Raleigh's" (men and women), aging, walking around unloved living vicariously through brother's/sister's sharing nieces or nephews in the place of husbands/wives or children. It's very sad. He was hurt so bad by his mother. He only wanted really to share James life. Living in a sense vicariously through him. Notice when he spoke it was always, we or your daddy and I or James and I, type of thing. The one time he wanted.. he wanted Gwen but she wouldn't have him. It was like he lost out to James again. It would be interesting maybe to hear a story about Raleigh and how James got everything but he got ...to share it? That's why I'd say all together this is a story about need. What each character needed. Yearned for. And what they got. Great character study. Those are just my thoughts. I hated that I waited so long to read this book. Tayari Jones walked my neighborhood, along my streets, past stores I shopped in and restaurants I ate at in Atlanta. Her characters went to schools my friends went to and many of their experiences were mine too. Those nostalgic 80's when life seemed to be bathed in neon and everyone wore jellies, but not even bright colors could cover up some of the scandals that rocked the local hair salons with gossip in real life and also in this almost-true-to- I hated that I waited so long to read this book. Tayari Jones walked my neighborhood, along my streets, past stores I shopped in and restaurants I ate at in Atlanta. Her characters went to schools my friends went to and many of their experiences were mine too. Those nostalgic 80's when life seemed to be bathed in neon and everyone wore jellies, but not even bright colors could cover up some of the scandals that rocked the local hair salons with gossip in real life and also in this almost-true-to-life story written by Tayari Jones. Dana and Chaurisse don't appear to have very much in common, but they do share something very significant - they have the same father, even though only one of them knows it. Their mutual dad, James, is a bigamist who lives his double life with the help of his best friend Raleigh. Written from the perspectives of both daughters, Silver Sparrow is the story of two separate families learning to live with a secret that only some of them are aware of. It is a suspenseful and heartbreaking journey into what it means to be a family and how the people in your life impact your self-worth. An intriguing story about an African-American man, James, who is a bigamist. James is married to two women at the same time,and has a daughter by each of them. The weird thing is James is actually a good man and it's easy to sympathize with his predicament. I liked the structure of the book; the first half was narrated by Dana, daughter of the second wife, and the second half was narrated by Bunny, daughter of the first wife. As Chaurisse didn't knows that her father was already married, it was p An intriguing story about an African-American man, James, who is a bigamist. James is married to two women at the same time,and has a daughter by each of them. The weird thing is James is actually a good man and it's easy to sympathize with his predicament. I liked the structure of the book; the first half was narrated by Dana, daughter of the second wife, and the second half was narrated by Bunny, daughter of the first wife. As Chaurisse didn't knows that her father was already married, it was pretty interesting to see what she made of things she saw and heard that we knew the cause of. One alternately feels sorry for both Chaurisse and Dana. The premise of The Silver Sparrow is so enticing! Narrated by two girls, one year apart in age, who both live in Atlanta and whose father is a bigamist. One knows, the other doesn't. Unfortunately, the book slumps along and never gets off the ground. I'm rating it 3 stars because it is readable, has great promise and was clearly good practice for An American Marriage. I have never read a story that even comes close to what Tayari Jones has created. Jones created a distinctive story, that engages the reader from beginning to end. While this felt very Young Adult to me, I was completely engrossed by page 10. And I am definately not a young adult. For some reason I was disappointed when the narrative voice changed from Dana to Chaurisse. The situation that both girls were put in was a result of their father's decision-making and Dana's mothers poor judgment. I co I have never read a story that even comes close to what Tayari Jones has created. Jones created a distinctive story, that engages the reader from beginning to end. I could not wait until the two sisters met and all hell would break loose. Yet I felt so heartbroken for both young ladies when they did find out the truth about their father James Witherspoon. I guess I like watching a train reck. I must say I respect and continue to be amazed with African-American hair. I loved the detailed descriptions and constant reference by both Dana and Chaurisse to their hair. I was disappointed in what I felt was an abrupt ending. I didn't feel closure. I didn't want to close the book and put it down. I felt there was more to be said. I will definately be reading the two other books written by Tayari Jones. Dragged a bit at times but never boring and there were some things I wish had been expanded upon more but I really enjoyed the story despite my small problems with it. I could sympathize with both sides for various reasons at times (not James) but sometimes I still wanted to shake people. This book is devastating. I never should have started it because there is only one way for a story like this to go. Now I just want it out of me. Damn. BTW: Tayari Jones, you can WRITE. Also, that epilogue is EPIC. So real and so heartbreaking. I am a hot mess. thankyouverymuch. A quick easy to read coming of age tale about two black teenage girls Dana and Chaurisse growing up in 1980's Atlanta who find out they are sisters when their father's secret lives are discovered. I'm not sure I've ever read a story about a bigamist before, but here James Witherspoon survives his duplicity with much better treatment than he deserves. Read for 10/18 KUYH club 3.5 stars for being predictable and somewhat emotionally flat for what I'm guessing would be an intensely charged situatio A quick easy to read coming of age tale about two black teenage girls Dana and Chaurisse growing up in 1980's Atlanta who find out they are sisters when their father's secret lives are discovered. I'm not sure I've ever read a story about a bigamist before, but here James Witherspoon survives his duplicity with much better treatment than he deserves. I must confess, that even after the conclusion of this book, the story continues to resound in my spirit. Silver Sparrow is a disheartening tale of two sisters, and a disturbing family secret that divides them for the better part of their lives. The central part of the novel takes place in 1980’s Atlanta, Georgia and is written in the narrative voices of the main characters Dana Lynn Yarboro and Bunny Chaurisse Witherspoon. At the opening of the novel, Jones introduces the reader to the vivaciou I must confess, that even after the conclusion of this book, the story continues to resound in my spirit. Silver Sparrow is a disheartening tale of two sisters, and a disturbing family secret that divides them for the better part of their lives. The central part of the novel takes place in 1980’s Atlanta, Georgia and is written in the narrative voices of the main characters Dana Lynn Yarboro and Bunny Chaurisse Witherspoon. At the opening of the novel, Jones introduces the reader to the vivacious and “silvery” beautiful Dana, who grows up knowing that she shares a father with another family. Dana progresses through childhood and adolescence making life decisions, at the insistence of her father, based on the course of life in which her ingenuous sister chose. The book then transitions into the narrative of Chaurisse, who is completely oblivious of the other family that her father fosters. It is not until the two sisters meet during a coincidental occasion, that the world that Chaurisse has grown to know begins to unravel, and unfolds the devastating truth about her father, James Witherspoon. Author Tayari Jones successfully creates a story that is like none other that I have ever read. That alone is worth the praise she is receiving from this novel. Jones beautifully created a distinctive story, that engages the reader from beginning to end. However, I was left disappointed by the way in which it ended. I am not a reader who expects each conclusion of a book to take on an enchanted “and they lived happily ever after” feel, but I do like to read the characters experience the justice in which they are due. I was left with an empty, unknowing feeling, that I truly hope is due to the fact that a sequence to the novel may be underway. As a result, I was unable to give this book the four stars that I hoped to provide it. I do, however, highly suggest this book to others to read. After I thoroughly enjoyed Jones' new novel, AN AMERICAN MARRIAGE, going back to her first novel was an obvious choice. Everything she did so skillfully with her second novel--switching points of view, making you empathize with characters you despised a few pages earlier, creating complex moral issues of family and loyalty--she does with SILVER SPARROW as well. Our characters are two teenage girls, half-sisters, the daughters of a man who married his mistress despite already being married. Only After I thoroughly enjoyed Jones' new novel, AN AMERICAN MARRIAGE, going back to her first novel was an obvious choice. Everything she did so skillfully with her second novel--switching points of view, making you empathize with characters you despised a few pages earlier, creating complex moral issues of family and loyalty--she does with SILVER SPARROW as well. Our characters are two teenage girls, half-sisters, the daughters of a man who married his mistress despite already being married. Only the illegitimate daughter knows of the other's existence. This is one of those stories about the way women tend to prefer to hold their grudges against other women rather than the men who are the real cause of their trouble, and one of those stories about just how much trouble those men can cause. Jones switches perspectives about halfway through the novel and it took me completely by surprise. I was so immersed in Dana's story, so absolutely loyal to her, that I started off feeling almost hostile to Chaurisse's perspective. But she quickly turned me around. The way Jones dives into these girls' lives, and also into the lives of their mothers, is just so good. I cared about them all so much, even as I watched Dana do things that I knew she shouldn't do, I'd spent so much time on her side that I understood why she was doing them. It's an excellent feat of characterization and storytelling. Bookclub selection. I read 50 pages then skimmed & scanned to the end. It's simply not a sort of fiction I enjoy. I just didn't care for the style or tone, nor the over-reliance on similes, clichés, facile observations, nor the florid summations sprinkled through out that make grand statements on life. Maybe mine was not a blissful girlhood. But is anyone's? Even people whose parents are happily married to each and no else else, even these people have their share of unhappiness. They spend plenty of time nursing old slights, rehashing squabbles. So you see, I have something in common with the whole world. When you have been the other woman or been other-womaned almost exclusively in your relationships, you begin to think that the world is Mad Men. That it is impossible to satisfy men by being just you within the strictures of a monogamous, hetero sort of relationship, and all it will take is a convenient narrative -- which may or may not be the truth -- told to an open-minded woman over a drink at the bar or on a run to the store to grab bread to find yourself in the crazed mind of one who is bei When you have been the other woman or been other-womaned almost exclusively in your relationships, you begin to think that the world is Mad Men. That it is impossible to satisfy men by being just you within the strictures of a monogamous, hetero sort of relationship, and all it will take is a convenient narrative -- which may or may not be the truth -- told to an open-minded woman over a drink at the bar or on a run to the store to grab bread to find yourself in the crazed mind of one who is being wronged and who knows it, but doesn't know it. I appreciate Silver Sparrow tremendously because it tells the story of the Other Woman in a way that shows, unsentimentally, how the Other relationship still affects the primary relationship when the primary relationship is yet blissfully untouched. How it creeps up on the seams of the "happy home life", always threatening to permeate. Tayari Jones' Other Woman story takes it a bit further: here the husband has another family, a daughter born and a mother married to legitimize the child. He visits them under the guise of "work." Jones captures well the slow torment of the second daughter, hating that she is the other and kept secret, and the surprising envy of the first relationship's child, who is not as beautiful as the second daughter, once their paths intersect as the second daughter is "surveilling" the first. The story is told initially from the perspective of the second daughter, who knows she is second all her life, and switches from her perspective to the first daughter's at the point she meets the second, who can sense that her new friend is keeping a secret from her. Painfully, only the reader knows how it is going to break her heart. In terms of the Other Woman herself, I felt a mixture of anger and sympathy. Anger because her complicity in the affair and then desire to marry hurts a family and because she talks openly about her and her daughter being more beautiful than the first wife, which is nasty. But also sympathy, because when she met her future husband she created a narrative about his relationship (that it was not a good one, because he bought his wife a knife as a gift, and who does that in a good relationship?) that legitimized her actions until they were irreversible. Those who've been in her place to some degree or another can understand how easy it is to rationalize your behavior by these narratives, especially when they are reinforced. He means to leave her. She knows and it's OK, their romance is gone. They didn't marry for love anyway. This is the first sentence of SILVER SPARROW. In this book, Tayari Jones, exquisitely exposes the raw edges of two families. Of course, she presents the the dilemma of two women, one aware and the other unaware, sharing one man. However, the relationship between the daughters of these unions is what is in the forefront here. No one could ever say James Whiterspoon was not a caring attentive, and supportive daddy. However, his diligence in this area actually made his dual life even more of a crime against his daughters. How do you reconcile being daddy’s “Buttercup”only to discover there is another girl he loves as much as you? And how do you reconcile being the “secret” daughter, living in the shadow of the “real” daughter? I’m not underestimating the grown women in this story, but that story has been told many times before. The old tale of essentially decent people making very poor decisions. Also, there are a couple of other relatives here who take their places in this crooked puzzle. Tayari Jones, does an exceptional job of weaving a very believable tale of two families where the male protagonist is the father of a daughter in each family. She expertly delves into the minds of both girls from their very early lives through young adulthood. The character development is such that one feels empathy for both girls and their mothers but, at the same time, leaves you with a sense of "Wake up and smell the coffee." While reading this book I kept thinking, Jones must know of a situat Tayari Jones, does an exceptional job of weaving a very believable tale of two families where the male protagonist is the father of a daughter in each family. She expertly delves into the minds of both girls from their very early lives through young adulthood. The character development is such that one feels empathy for both girls and their mothers but, at the same time, leaves you with a sense of "Wake up and smell the coffee." The book started off pretty well. The storyline was intriguing and seemed a bit familiar. However, I found it very difficult to like any of the characters in the story. I think that the author should have chosen to share the stories of Dana and Chaurisse at the same time instead of first giving Dana's view then Chaurisse's. By the time Chaurisse time had come, I was already a bit bored. I do think Jones has great potential in penning a good novel. She just missed the mark on this one. Enjoyed the message. Didn't really care about hearing the story from the daughters perspective. I would have liked for the story to just flow. The story ended with so many unanswered questions. I'm hoping for a sequal. Enjoyable, but I wish the author had taken it to an even deeper (social-psychological) level. The aftereffects of bigamy is the central theme of Silver Sparrow, a novel told from the perspectives of James Witherspoon's daughters: Chaurisse from his legally wed, older, plainer-looking first wife and Dana, the result of an affair with a much younger, attractive "wife," illegally wedded some time after Dana's birth, four months before Chaurisse's. From the onset, Dana's world is shaped by the whims and priorities of Chaurisse's. One of her earliest memories is John telling her she is the "s The aftereffects of bigamy is the central theme of Silver Sparrow, a novel told from the perspectives of James Witherspoon's daughters: Chaurisse from his legally wed, older, plainer-looking first wife and Dana, the result of an affair with a much younger, attractive "wife," illegally wedded some time after Dana's birth, four months before Chaurisse's. From the onset, Dana's world is shaped by the whims and priorities of Chaurisse's. One of her earliest memories is John telling her she is the "secret" and no one should know he is her father; she is to tell others that Uncle Raleigh (James's foster brother) is her father. She and her mother are fully aware of James's public/legal/first family and increasingly feel slighted; often exhibiting their insecurities by spying on Chaurisse and her mother to compare physical appearances, material items, academic achievements, etc. No doubt over time, this situation wears on the psyche, curiosity mounts, and Dana sets out to meet Chaurisse despite James's direct order of no contact whatsoever. Complicating matters even further -- Chaurisse and her mother know nothing of Dana and her mother even though they live in close proximity. As one can imagine, drama, somewhat forced and unbelievable, ensues in abundance and the rushed and somewhat "open" ending hints at a sequel. Bigamy is a conscientious adult decision but this novel fails to truly answer the "whys" that pop into mind almost from the beginning. Unfortunately, the only two perspectives shared in the book are the girls' as they evolve from childhood to young adulthood. Even when snippets of their parents' rationales and interactions are shared, all is filtered with a child's understanding with no probing, only unconditional acceptance. This regrettably gives the novel a "Young Adult" vibe (perhaps intentionally?) and never truly delves into the more mature, complex adult themes and motivations that created their world and affect them so negatively. Instead, this novel skims the surface of the issue and resorts to the contrived, inevitable, and oh-so-predictable confrontation of the wives scene as the novel's climax. Glimpsing deeper into the psyches of the parents, the creators of this quagmire, would have added more depth, addressed many of the unanswered questions that loom between the lines, and if executed well, could possibly have increased Jones' fan base. This was a pleasant read for me. It started slow, but when it finally got my attention I didn’t put it down. Jones does a good job of creating imagery. Also conversation among female characters was filled with a lot of cute and sassy phrases about no good men, love and relationships in general. I felt as if the narration was uneven. Meaning Dana was given more of the substantive material. Also there were some unnecessary parts and some parts I felt weren’t explained enough. I could have done wit This was a pleasant read for me. It started slow, but when it finally got my attention I didn’t put it down. Jones does a good job of creating imagery. Also conversation among female characters was filled with a lot of cute and sassy phrases about no good men, love and relationships in general. I felt as if the narration was uneven. Meaning Dana was given more of the substantive material. Also there were some unnecessary parts and some parts I felt weren’t explained enough. I could have done without so much of the Al Green and the grits situation and an entire chapter on how James started the business. These could have been condensed. Also I wanted to know more about Ida Mae’s death. How did that affect Gwen? What about James and Raleigh? They knew her very well also. Speaking of Raleigh, what was his relationship Gwen and Dana after the truth was exposed? I really wished in the epilogue Jones would have included narration by Gwen and Laverne. Man oh man what did Gwen say when Dana told her about her confrontation with James the night of the rededication?! Did things between James and Laverne get back to ‘normal’? Silver Sparrow had its flaws, but ultimately it made me want to know more about these characters. I would recommend it to others. Oh how I wanted to love this. I've heard great things about Tayari Jones and her other books and was really looking forward to enjoying this novel, but came away with feeling slightly cheated by it. What started out as quite a fresh idea (a self-made business man, named James Witherspoon, who is a bigamist with his two daughters, Dana and Chaurisse, caught in the middle) just seemed to wimp out once the point-of-view changed and the character development began to wane. What I wanted from this bo Oh how I wanted to love this. I've heard great things about Tayari Jones and her other books and was really looking forward to enjoying this novel, but came away with feeling slightly cheated by it. What started out as quite a fresh idea (a self-made business man, named James Witherspoon, who is a bigamist with his two daughters, Dana and Chaurisse, caught in the middle) just seemed to wimp out once the point-of-view changed and the character development began to wane. What I wanted from this book was something more provocative. Something a bit meatier with less back story and more answers as to why the characters did what they did and why they lived their not-so-normal lives. Why Dana's mother carried the weight of being 'the other wife' for so long? Why Uncle Raleigh just hung around in limbo accepting what his brother was doing and not living his own life? Was Dana really looking for a friend in Chaurisse or was there another motive since she knew they were sisters and Chaurisse didn't? And the biggie, why in hell James decided he needed two wives? These and more questions were never answered. Yeah, maybe I'm a bit greedy wanting to have all the answers and a more cut-n-dry prose to explain those things. Life isn't all sunshine n' glitter to where everything is explained and sometimes a bit of mystery is what makes a story, but something about not getting that in this book, with this really heavy handed topic, is a bit of a cop-out to me. I mean, we as a Western society are sort of fascinated by bigamy and polygamy, we want to know all the 'why's' and 'how comes' because this isn't typical terrain for us. Also I felt this book could have taken lots more turns to actually answer these questions. Like maybe the big 'secret' should have been revealed in the beginning and we could have seen how the characters navigated that rocky road with the girls grown and the adults lifestyles catching up with their age? Or maybe the story would have been better served telling it from the wives point-of-view? I don't know, I'm not the author so what do I know? The bright spot is that Jones is a more than capable author. Her prose is a bit basic, pretty, and borders on YA territory for this book. It also suffers from far too many similes ('like a' this and 'like a' that--as someone who aspires to write this screams 'workshopped'), plus there are some typos were pretty obvious (who edited this book? ), but she does end up captivating you and drawing you into the polar worlds that James has created making you turn every single page, and that should be merited. This was an enjoyable read, although not particularly about an enjoyable subject. The first line is the hook! "My father, John Witherspoon, is a bigamist." I really appreciated that, Tayari Jones, told the story in two parts, through the eyes of John Witherspoon's two daughters. One from the "public" family and the other the daughter in the"secret" family. I empathized with the "secret" daughter Dana and felt for her. I had a harder time relating to Chaurisse. This book takes place in the 1980's, This was an enjoyable read, although not particularly about an enjoyable subject. The first line is the hook! "My father, John Witherspoon, is a bigamist." I really appreciated that, Tayari Jones, told the story in two parts, through the eyes of John Witherspoon's two daughters. One from the "public" family and the other the daughter in the"secret" family. I empathized with the "secret" daughter Dana and felt for her. I had a harder time relating to Chaurisse. This book takes place in the 1980's, yet I kept thinking it was the 1960's. I'm not sure why, but perhaps, it was the Southern culture or the hairdresser. I haven't thought much about the subject and I'm sure it exists more than I know. I love a book that puts the reader in the shoes of the characters and this read did that for me. Tayari Jones has told the story with compassion and humor. Another favorite quotation in the book is, "You can't put the rain back in the sky". I'm not sure if this is an old saying or not, but it is certainly worth remembering and beautiful.